We finally were all able to come together at about 7pm. It was New Years Day and none of the plans that has been made earlier in the day had succeeded, but I couldn’t help having an excitement for returning to the cliffs that I had visited a couple days earlier. My two friends and I climbed in the car and headed to the beach. It seemed a little insensible since the sun had already gone down, but none the less seeing the beach at night would be fun too. We drove just south of Oceanside, CA to Carlsbad. It was a little colder than it had been the last couple of days and I had left my boots and jacket back at the house not really thinking I would be cold. After borrowing a jacket and just loosing my shoes all together- we traveled along a (sometimes 10 inch) cliff trail. At one point we came to a larger plateau where we each took a seat with our feet hanging over the edge looking at the enormous body of water that seemed to come to life. The moon was bright with stars shining through the fog that gently hung over the water as if asking permission to come closer. Every once in a while the light of the moon would perfectly reflect on white caps of the distant approaching waves. They seemed to glow as they came to life for a split second then tumbled back into the great dark consuming abyss. I felt so close to God. So close to His creation. So small, yet so valued. I have had over 9 hours of straight alone time in my car contemplating this moment at beach that night. I have come to a conclusion: I want to live. That may seem weird, but it feels like a big deal right now. You see, on New Years Eve I started having a pity party. Being the eternal optimistic I tried to encourage myself. After crying a while I started asking myself some serious questions. Well, obviously I keep thinking all of my problems would be solved and everything would be great… if. But the truth is whether that “if” ever comes to pass, I still will be here. So, what can I really look forward to? I can wait. Wait for that… or this… but if all I do is wait… I’m going to be pretty miserable at the end of every day. Because I will find that… I had never lived. Yeah, I want to get married. I want to have that special calling and purpose of being a Mom and Wife. I want to serve a family. But guess what? I can’t. God hasn’t given me those things… so what am I going to do? 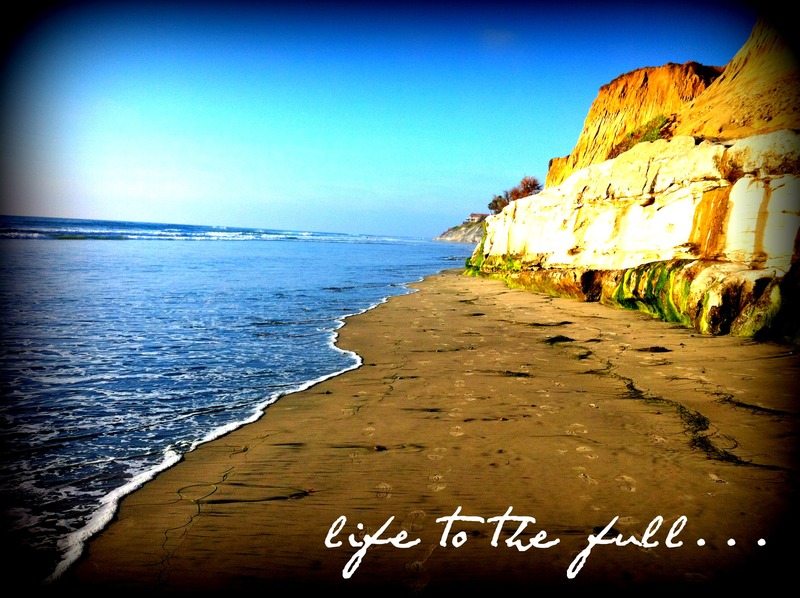 I’m going to live life to the full… because that is something He has promised. (The thief comes to steal, kill, and destroy, but I have to come to give life and life to the full. -Jesus). I’m going to have an adventure. I’m going to live so that if I died in a year, a month, or a day. I will not regret what I did or didn’t do. I’m going to go on the hike even though it’s night. I’m going to go even if I don’t have the right shoes (personally I liked having the sand between my toes… I also felt like I had better footing barefoot). I’m going to experience what the Lord has for me each day. I’m going to be honest. I am so tired of always trying to never ever make people feel uncomfortable or bad… so I fib or say something “nice” that they want to hear. No. I’m done. (My goal isn’t to be rude) but I will be honest. I’m going to stop having stupid surface conversations. I want to know you more on a deeper level. I want to know what you are living for. I want to know if you really do know Jesus. And how? And Why? I want to explore and experience this world that God has given us to enjoy. I want to share in real life with people every day. I don’t want to become senseless… I want my senses to awaken. I want to see the glow of the white caps and hear the roar of the waves. So, I decided to figure out the difference between the things that actually make me feel alive and those that make me feel empty and devoid. So what are the things that make me feel alive? What are the things I’m going to do? Well, that’s a little harder, because I don’t think I can really put my finger on what makes me feel alive. So, this is what I’ve decided to do. Just as I have shared with you a story of how I felt alive on my first adventure day of this year at the cliffs, I’m going to share with you stories of when I have felt alive. Not only will these stories be from the past (which I have quite a few on my mind I would love to share) but hopefully they will be from the coming adventure as well. As long as I am here on this earth… it means He has a plan for me. Am I going to live the life and plan He has for me? Or am I going to wait for the things I want? I’m going to choose life. So, what about you? Are you alive? I choose to live life and to live it to the full. Lord, I want to live this life to the full. Today. Tomorrow. And every moment I have breath. Help me Lord, show me where to go and how to be alive. I want to be real. I want to be Yours. I don’t want to regret or wait to live. Please Lord help me live life to the full NOW. This entry was posted in living and tagged christianity, Church, cliffs, family, God, honesty, Jesus, life, real, relationships, Truth. Bookmark the permalink. I love beach get-a-ways!! (: It clears your mind. Love it! When I wonder if I should step out onto the edge or not, I will say yes. I will walk the edge whenever possible! I will do it with my eyes and heart focused on the Lover of my soul. I will taste and see. I will find out for myself. I will listen to that still small voice, and follow. Sometimes it will take me to a mountain top ecstasy; other times I will end up in a dark and mysterious cavern. At times I will laugh; at times I will sob. I will live. I will praise Him for every single opportunity to LIVE. I needed to read this…this morning! Thank you friend! wish we still lived together right now but God has called us both to different places…I will live for today…embrace each day as a gift…and try to live with no regrets. I’m going to live too! Do all the things I’ve always wanted to do, and stop waiting for that perfect someone to do them with, in shaa Allah.